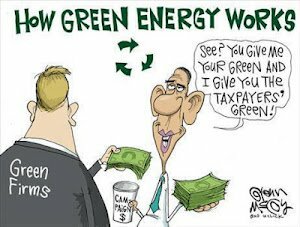 Connect the Dots :: Obama’s Clean – Energy Dirt – Stealing You Blind for a Good Cause? Cronies tied to at least $10 billion of Obama’s taxpayer funded green-energy spending spree: Energy-sector 2009-Recovery Act advisor and Jobs Council member, billionaire John Doerr’s VC firm Kleiner Perkins –– Al Gore partner, and KPCB collaboration with the London based Generation Investment Management. Council Members,” I covered Obama’s Jobs Czar, Jeffrey Immelt and the fact that General Electric, a top 2008 Obama donor, has been making bank off of Obama’s 2009-stimulus package –– GE’s “green tab” exceeds $3 billion in direct (some indirect) taxpayer cash, and counting. Last July when I chronicled General Electric’s “big green stimulus bucks,” I also revealed the cozy ties and “green alliances” that Immelt has with other Jobs Council members and other high-profile fat cats, including John Doerr. One in particular was formed in 2010 –– the American Energy Innovation Council (AEIC), which called for “a tripling of U.S. federal energy research budget.” GE joined forces with others that have benefited from Obama’s alternative-energy taxpayer funds, like the Advanced Metering Partners, another Doerr “venture” via Silver Spring Networks, one of Kleiner Perkins shining green companies, which in 2009, cashed in big time when the DOE starting handing out $4 billion in smart grid grants. But that’s just the start…Billionaire John Doerr, partner at Kleiner Perkins Caufield & Byers (KPCB), along with his “billionaire climate buddy” Al Gore, is considered “a very big-ticket Obama donor” by New York Magazine, who in February 2011 hosted a star-studded billionaire Silicon Valley dinner for the president. Doerr not only sits on the President Obama’s Jobs Council (also from Obama’s 2009 PERAB), but early on he ultimately shapedwhat went into the energy sector of the president’s 2009-Stimulus package. In my three-part 2010 summer series, “Obama’s Political Payback: Green Corruption,” I warned that billions of stimulus money was going to Doerr and Gore; however, besides being RIGHT, since that time, they have tripled their portfolio and thus warranted another look.In 2010 I calculated that over 50 percent of the companies listed on Kleiner Perkins “Greentech Portfolio” secured all kinds of loans, grants and special tax breaks (federal and state), and at that time I reported that of the nineteen, nine were lucky winners. Then in 2011 new reports came out from Peter Schweizer’a bestseller, Throw Them All Out(referenced throughout as Peter’s Book), revealing that as many as sixteen (of 27) “received direct taxpayer support in the form of loans, grants, or stimulus work.”Now with 66 listed –– although in reality it would take a team of investigators to track all the money –– as one-person researcher, I’ve found much more. 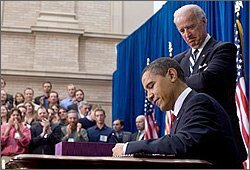 My conclusion is that over 50 percent (again) are confirmed 2009-Recovery Act winners (36 of the 66). This means that ultra-rich Doerr and Gore –– through their alternative energy investment firm –– have raked in at least $1 billion in green-government subsidies, the majority coming from President Obama’s 2009-stimulus spending spree. Kleiner Perkins is also tied to over $9 billion of Obama approved DOE loans and 2009-Recovery Act funds. 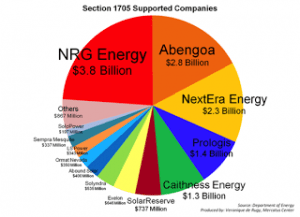 Through Gore’s UK-based Generation Investment Management (GIM), there’s Abengoa (a Spanish firm) that received three loans from the 1705 Loan Guarantee Program totaling close to $2.8 billion, which also recently got more money from another “massive taxpayer-backed fund for corporate welfare” –– the U.S. Export-Import Bank. While this too carries its very own corruption slant, the $150 million is going for green jobs, not here in the United States, but overseas. Hmm, our jobs council must be proud. But Gore wasn’t the only one selling out –– during a brutal (May 16, 2012) House Oversight hearing the truth came out, First Solar’s CEO Michael Ahearn sold 700,000 of his own shares in August 2011, of which he personally raked in a whopping $68.5 million, with reports of more. Ahearn also relunctantly admitted, “in sheer numbers, most of our full time [employees] are outside the US” –– I think to Spain. Another one involves Kleiner Perkins “nuclear buddy” AREVA (Ausra Inc., also a GIM investment, acquired by the French company AREVA February 8, 2010) and its $2 billion “POTUS approved” loan. Plus Ausra, now Areva Solar Inc. was awarded close to a $14 million 1603 grant for “solar electricity” in California two weeks later. Topping off this “stimulus winner” connection list is their shining smart firm, Silver Spring Networks as well as OPower, of which both are tied to at least $1.3 billion of the Recovery Act Smart-Grid Grants. So billions of stimulus money and green jobs are going to foreign companies –– where’s our jobs council on this? While Doerr is a known Obama donor, we find that “Top Kleiner Perkins executives have given more than a million dollars to federal candidates and parties since 1991, most of it going to Democrats. Obama himself has received $19,000 from the company’s employees,” reports the National Review Online. In 2010, I had written extensively on Doerr and Gore, and mentioned David Blood. Doerr and Gore –– the “climate duo,” whose combined “carbon footprint” is larger than my entire city –– friendship dates as far back as the 90′s. Since being converted to “global warming” by Gore in 2005 with “a convenient hype,” Doerr has become a “green evangelist,” with his climate crisis message, “I’m really scared, I don’t think we’re gonna make it.” At the same time Doerr continually markets green-energy as “the mother of all markets” –– $6 trillion a year worldwide. In 2004 Gore started a company with former CEO of Goldman Sachs Asset Management David Blood –– Generation Investment Management (GIM): “Sustainable Investing for the Long Term” –– whereas Blood is the “wizard behind” GIM, and other executives include two other Goldman bigwigs, Mark Ferguson and Peter Harris. In 2007, GIM and Kleiner Perkins created the “International Alliance to accelerate global climate solutions,” and about that time, Gore became a partner of Kleiner Perkins and Doerr joined the GIM advisory board. Before we dissect more of Kleiner Perkins “green,” I’d like to note that last May The Washington Free Beacon exposed Senator John Kerry, whom President Obama recently nominated as Secretary of State to replace Hillary Clinton, and his part in this green-energy scheme. Kerry, the co-author of cap-and-trade legislation, more specifically the 2010 American Power Act, is another 2009-Recovery Act green-energy crafter, along with Doerr and five others that I found, which have cashed in big time from the stimulus funds (a forthcoming, explosive post).As revealed by The Free Beacon, “the Senator played a key role in crafting the portions of the legislation designed to offer federal support for green energy projects. Kerry also “purchased —through family trusts — between $30,000 and $100,000 worth of shares in a number of KPCB investment funds, including its “Green Growth Fund [that lists fourteen companies], and continued to purchase shares throughout 2010, according to the Senator’s financial disclosure forms.”Kerry is also tied to quite a few other high-profile banks and firms that received DOE loans and grants, however, Marita Noon (from Townhall.com) and I will be doing a full bombshell story on Senator Kerry’s role in this green-energy, crony-corruption scandal in the very near future. Next, I’d like to expose what I found in the October 31, 2012 House Oversight emails (that included a memorandum as well as Appendix I and the 350+ page Appendix II) related to four large Department of Energy (DOE) transactions. The first one I had alluded to in the beginning, which is tied to Gore’s GIM company, while the other three to Kleiner Perkins –– one acquired, one a direct investment, and the other as a contractor. Keep in mind that the DOE Loan Guarantee Program (LGP) consists of three separate programs, Section 1703, Section 1705, and Advanced Technology Vehicles Manufacturing (ATVM), of which the 1705 was created by the stimulus, and the other two were approved by the Obama administration. Spanish company Abengoa that received close to $2.8 billion in loans, making them the second largest recipient of the $16 billion doled out through the DOE 1705 loan guarantee program. Abengoa has two solar projects: Solana and Mojave Solar. Solana’s Fitch rating is BB+. Just before Christmas, 2010, the company received $1.45 billion from the DOE for a solar thermal plant, to use parabolic trough technology in Gila Bend, AZ. Mojave Solar’s rating was BB. Yet the company received $1.2 billion in September 2011 for its solar assembly collection project in San Bernardino County, CA. Abengoa has connections to . In addition to the two solar projects listed above, Abengoa also has a biofuel project located in Kansas, which Fitch rated CCC that got a $132.4 million loan in August 2010. So how did such a poorly rated, non-American company get billions in US taxpayer loan guarantees? Can you say “crony corruption?” A story Marita and I wrote last summer, but in short, Abengoa has a cadre of cronies in high places which not only involves Al Gore, but former New Mexico Governor Bill Richardson, California’s Democratic Senator Dianne Feinstein, and, of course, President Obama — plus, many others whose names you’ve probably never heard of. Also, as I mentioned, in December 2012, the Export-Import Bank of the United States authorized $150 million in loans to Abengoa: $78.6 million direct loan to Spain-based Abengoa, and $73.6 million direct loan to a wind farm in Uruguay, which is owned by Abengoa –– as part of “an ambitious goal set by President Obama, of doubling U.S. exports in five years,” which to me in the case of Abengoa, we are exporting billions of US tax dollars to Spain. What’s relevant at this point, is that in 2007, Gore’s UK-based Generation Investment Management (GIM) bought a stake in Abengoa. He has extolled Abengoa for years, visiting “the largest solar platform in Europe” (operated by Abengoa) in October 2008 and delivering a high-powered speech at the company’s Spanish headquarters in October 2010. GIM Advisory Board Member Mario Molino also serves on Abengoa’s Advisory Committee. Ausra Inc. –– a KPCB investment that “develops and deploys utility-scale solar technologies,” February 8, 2010, was acquired by AREVA Inc. Then May 21, 2010, “The U.S. Department of Energy offered a conditional commitment for a $2 billion loan guarantee to AREVA to facilitate financing of its Eagle Rock Enrichment Facility planned for development near Idaho Falls, Idaho.” Plus Ausra, now Areva Solar Inc. was awarded close to a $14 million 1603 grant for “solar electricity” in California two weeks later, February 26, 2010. Steny Hoyer when he was the House Majority Leader in 2010, however, we need to get back to Kleiner Perkins. One of the most blatant examples of government favoritism, catching headlines in the Wall Street Journal back in September 2009 (Gore-Backed Car Firm Gets Large U.S. Loan) was the $529 million ATVM loan guarantee, a huge deal that was cinched in April 2010, went to Fisker Automotive. Yep, Doerr and Gore’s Fisker DOE loan ignited red flags, partly due to the fact that the funds were for its high-end, hybrid sports coupe, Fisker Karma that was to be manufactured in Finland and sold for $89,000. Still, haven’t a few gone up in flames lately, and what about those layoffs? In fact Fisker too, made it on my 2012 Green-Energy Failure Alert List (total at 52), in the troubled category –– as they are possibly on life support. And what about the $21.5 million Fisker got from Delaware, which is composed of a $9 million grant and a $12.5 million loan, yet as of January 5th the company has yet to produce a car in Delaware. EMAILS dated May 16 to 18, 2011, where the aforementioned were discussing Next AutoWorks (they were seeking a $320 million ATVM loan) and the fact that Jonathan Silver was meeting with John Doerr on Tuesday, May 24, 2011. NOTE: Kathleen Ligocki is an Operating Executive at Kleiner Perkins Caufield Byers (since September 2012) and serves as Chief Executive Officer of Next Autoworks Company (since 2010), a Kleiner Perkins company. In May 2009, USG started the DOE loan process, and in June 2010, USG announced that it “was offered a conditional commitment for a $102.2-million loan guarantee from the U.S. Department of Energy,” slated to build a 22-megawatt power plant in the eastern Oregon desert. And just a week later, February 24, 2011, USG secured the loan for $96.8-million via the 1705 loan guarantee program –– one of the first geothermal projects funded by the DOE, despite the fact that in December 2010, S&P gave it a “BB,” non-investment grade. Now why is US Geothermal relevant to John Doerr? Well, besides the fact that this Oregon-based project is “expected to create 150 construction jobs and 10 permanent jobs” for whopping $97 million — another tainted mark on Obama’s jobs panel –– Doerr and Gore are in cahoots with Goldman Sachs on many of theses green-energy deals, and as you continue reading you’ll discover this entire green-energy scheme. It turns out that in June 2010, “USG selected “TAS Energy, Inc. to supply high efficiency, modular, clean energy power plant technology for its Neal Hot Springs geothermal power plant in Eastern Oregon.” In that announcement they mention the $102.2-million loan guarantee from the DOE. Furthermore, the day the USG loan was finalized, TAS Energy “was awarded a contract by USG Oregon, LLC, a wholly-owned subsidiary of U.S. Geothermal Inc.” And interestingly, TAS Energy became part of Kleiner Perkins Green Growth Fund, a deal they closed in June 2011. So, while I can’t locate any direct stimulus funds for TAS, they did get a JOB, and are still getting paid with taxpayer money, and from the Recovery Act. In September 2009, the DOE finalized an award for the Raft River EGS program, which they state, “now totals up to $10.21 million, with the DOE providing up to $7.39 million as part of the cost-sharing arrangement.” It also states, The Raft River EGS project is one of 21 projects that are scheduled to conduct research, develop and demonstrate the viability of Enhanced Geothermal Systems. The DOE provided up to $78 million in funding for the 2008/2009 programs,” and it began in February 2010. Besides General Electric and Gore’s Generation Investment Management, Kleiner Perkins is also in cahoots with other fat-cat Obama bundles and donors –– two became DOE Advisors –– that were huge winners of the Obama “green stimulus cash” (taxpayer money that is): Goldman Sachs, Khosla Ventures, and The Westly Group as well as Vantage Point Capital Partners and Google Ventures. Back in 2010, I reported on Goldman Sachs and the fact that they were cashing in on the green stimulus, and as my research developed, found their DNA is all over this green-energy scheme, including “The First Solar Three Billion Dollar Swindle,” explained earlier. What you should know about Cogentrix, besides the fact that $90 million of taxpayer money went to create a whopping 10 jobs, is that with this one transaction, Goldman Sachs cashed in every step of the way –– and their green cronies too. (A striking detail that I found when reviewing the June 19, 2012 House Oversight Hearing, where the CEO of Cogentrix Mr. Robert Mancini testified). This is relevant not just because of the obvious cronyism and deep-seated corruption, but this green deal making is also tied to Amonix, a Gore and Doerr (also Steve Westly, DOE Advisor) investment, which received over $20 million in federal tax credits and grants, and went bankrupt July 18, 2012. More on Amonix later. I’ve noted Obama’s Wall Street Buddies in previous posts, and have written extensively about the president’s connection to Goldman Sachs –– the number two top Obama donor in 2008. Also, two Goldman executives sat on Obama’s 2008 Finance Committee, Bruce Heyman and David Heller, while Jennifer Scully and Bruce Heyman were 2008 bundlers –– Heyman was also a 2012 Obama bundler. Even without extensive research, Goldman Sachs is tied to many other clean-energy projects that received loans, grants and special tax breaks from the Obama administration, and what I’ve tracked so far are billions of stimulus money from the DOE; First Solar, Cogentrix, and U.S. Geothermal. They are also credited as the “exclusive financial adviser” for now bankrupt Solyndra, and in 2010, handled the IPO of both Tesla Motors and Amyris. There are more bankrupt ones as well –– SpectraWatt and Nordic WindPower, as well as “struggling” SunTech, taking billions of taxpayer money down with them. NOTE: All but three of the above are on my 2012 Green-Energy Failure Alert List. Markets (link no longer valid), besides First Solar, U.S. Geothermal, Nordic WindPower, and SunTech, there are six more. One that sticks out in my memory is Horizon Wind Energy, of which “EDP-Energias de Portugal SA, the country’s biggest electricity utility, agreed to buy Horizon Wind Energy LLC of Texas from Goldman Sachs Group Inc. for $2.15 billion,” and Citigroup Inc. advised EDP on the Horizon acquisition,” according to Bloomberg in 2007. Now Horizon is very relevant to the “Wind Energy Blows in More Green Corruption” story that I will be telling soon. But in the meantime, you’ll be “blown away” by the billions of “wind energy grants” that flew out of the 2009-Recovery Act back in February 2010, the majority of which went to projects owned by foreign companies. And Horizon-EDPR (Portugal) was the winners of four totaling over $277 million. In March 2012, Goldman Sachs announced its plan “to channel investments totaling $40 billion over the next decade into renewable energy projects, an area the investment bank called one of the biggest profit opportunities since its economists got excited about emerging markets in 2001,” writes Reuters –– meaning they’ll be pursuing for more government aid. Mr. Khosla happens to be another big VC winner in the green taxpayer funded giveaway, which includes Ausra (listed above), Coskata that snagged a $250 million DOE loan, as well as Nordic WindPower (also a Goldman Sachs investment, listed above) for $16 million, plus much, much more. Vinod Khosla, an affiliated partner of Kleiner Perkins, whose firm Khosla Ventures has also invested in some of the same companies as Kleiner Perkins –– these include Ausra Inc., AltaRock, Amyris, Great PointEnergy, Mascoma, and QuantumScape (part of Khosla Ventures “sustainability portfolio“), and all received Obama stimulus funds. 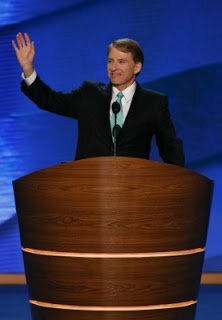 Meet Steve Westly, the Founder and Managing Partner of The Westly Group, and a “DOE Insider,” as well as another Obama crony who made a DNC 2012 cameo. Westly is a two-time Obama bundler, sat on the campaign’s National Finance Committee, and was a co-chair of the 2012 Technology for Obama group. He was briefly considered for a cabinet level position in the Obama administration, and in August 2010, Westly secured a top advisory role inside the DOE, close to Energy Secretary Chu. In 2011, Westly was tagged as the “Green bundler with the golden touch,” where IWatch points to “a trail of [green] loans, grants and tax breaks.” However, I found more –– as of today they list 20 firms (exited and current), and at least 50 percent of The Westly Group portfolio were winners in the Obama green-energy spending spree. The most infamous is the Tesla Motors $465 million ATVM loan, which made it on my 2012 Green Energy Failure Alert List, in the troubled category with its array of Democrat cronies. Throw in Soladigm (now called “view“), CalStar Products, and Enerkem, which 2009 got $50 million of DOE Recovery-Act funding, and in 2011, 80 million loan guarantee by the U.S. Department of Agriculture (USDA). SCIenergy, Inc., which in January 2012 got $2.8 million, plus more from city of San Jose via the stimulus. Meanwhile ShotSpotter is getting wired from stimulus funds, and in 2010, Revolution Foods got a DC contract for two “healthy school meals” pilot programs. Add another “DOE Insider,” Sanjay Wagle, who was an Obama fundraiser for the 2008 campaign through his Clean Tech for Obama group. After the 2008 election, Wagle joined the Obama administration as a “renewable energy grants adviser” at the Department of Energy under Secretary Chu (reported to beat the ARPA-E program at the DOE).Prior to arriving in Washington, Wagle was a principal at Vantage Point Venture Partners, a cleantech venture capital firm, where Robert F. Kennedy Jr. is a Partner and Senior Advisor. However, according to some Greentech defenders, “Wagle gave up any interests in VantagePoint and the companies it invested in before joining DOE,” and left the DOE sometime in 2012. That may be true (although I’d like to see the proof), but Wagle was part of the September 22, 2009, Valerie Jarrett “CLEAN ENERGY SUMMIT” held at the White House, whereas “attendees [had] struck gold, cashing in on $5.3 billion in taxpayer funds from the Obama administration.” This was as of June 5, 2012, but I found much more. Part of that “gold rush” included Vanatage Point‘s portfolio, which has at least nine green firms that have snagged green-government subsidies, and three are listed on my 2012 Green Energy Failure Alert List; Telsa Motors, BrightSource Energy and its $1.6B Shady DOE Deal, as well as Serious Energy –– all listed in the troubled category. Meanwhile there are many tied to other “green allies” that were huge winners of “green” taxpayer money, but four are Kleiner Perkins investments: Amprius, FloDesign, Mascoma, and MiaSole’. In my last post about GE, I shared a set of DOE emails that revealed pressure by the White House (specifically, Vice President Joe Biden, who was supposed to be the Stimulus Sheriff) in the Shepherds Flat wind project in Oregon (Caithness Shepherds Flat, LLC). However, last summer, I divulged that after the huge $1.3 billion DOE loan was finalized in December 2010, four months later, another close associate of, and big donor to the president invested in Caithness. As uncovered in Peter’s Book, “Google’s CEO at the time, Eric Schmidt, served as an informal advisor to President Obama.” Still, Schmidt, Google Executive Chairman, was an Obama donor in 2008, and since April 2009, is a member of the president’s Science and Technology Advisory Council (PCAST). In fact, Google’s $814,540 contribution to Obama’s campaign made it the fifth largest donor in 2008, and in 2012 moved up to the number three spot with a whopping $805,119. Another Google connection is Dan Reicher, director of climate and energy initiatives at Google, was one of the founders of Cleantech and Green Business Leaders for Obama. While there are other interesting folks behind the Google scenes, John Doerr has served as a member of Goolge’s board of directors since May 1999. As of late, Google has aimed its “search engines” at green technology, many of which have received government help –– BrightSource, Solar City, Telsa Motors, and others. In fact, Google Ventures, Energy Investments list include (d): CoolPlanetBioFuels, Amprius, Clean Power Finance, Nest, Next Autoworks, Silver Spring Networks, and Transphorm, the latter six are also part of Kleiner Perkins greentech portfolio with four verified Recovery Act winners. You can bet your bottom dollar, if you have one left, that we’ll find tons more green-energy funds inside these fat cats’ treasure chests, especially since the DOE continues to hand out checks. Furthermore, in an interview for TIME’s Person of the Year award, President Obama said “the economy, immigration, climate change and energy would be at the top of his agenda for the next four years.” So, if our president gets his way with more stimulus and/or renewable energy funds (and he will, just watch for the sales pitch, “invest”), this Elite Green Group will be there with their hand out for more corporate welfare checks, and President Obama will oblige –– after all they got him elected in 2008 and re-elected in 2012, political payback. What really ticks me off, is that if these ultra rich dudes REALY want to save the planet, why don’t they use their own dang money? Comments Off on Connect the Dots :: Obama’s Clean – Energy Dirt – Stealing You Blind for a Good Cause? Emilio Lozoya Austin, CEO of Mexico’s state-controlled oil company PEMEX, has visited Keppel Fels shipyard in Singapore, where the company’s two jack-up rigs are under construction, said PEMEX in a press release issued on Wednesday. The rigs, of KFELS B Class jackup design, are scheduled for delivery in 2015. The two jack-ups, able to operate in water depths of up to 400 feet and drill to depths of 30,000 feet, will be deployed in the shallow waters of the Gulf of Mexico. During his visit, Lozoya Austin said that PEMEX is undergoing the most ambitious drilling program in decades. He said that the Mexican oil company is working to become an oil company with the world’s highest number of jack-up rigs in operation. Lozoya Austin also added that, as a part of Pemex’s rig fleet expansion program, eight to twelve new offshore jack-up rigs will be constructed. Pemex currently operates 41 offshore drilling rigs, five of which are semi-submersibles and 36 of those are jack-ups. The head of PEMEX, the world’s fourth-largest crude producer at 2.5 million barrels per day, also visited the Jurong shipyard SembCorp and SembCorp PPL. PEMEX Considering Construction of Eight to Twelve New Jack-up Rigs| Offshore Energy Today. Construction is currently underway at the La Quinta Channel Extension Project in Nueces County, Texas. Work includes deepening the channel extension and creating a beneficial use site with a scheduled completion of July 2013. More: Dredging Today – USA: Extension Project on La Quinta Channel Underway. Kinder Morgan Energy Partners and Copano Energy announced a definitive agreement whereby KMP will acquire all of Copano’s outstanding units for a total purchase price of approximately $5 billion, including the assumption of debt. The transaction, which has been approved by the boards of directors of both companies, will be a 100 percent unit for unit transaction with an exchange ratio of .4563 KMP units per Copano unit. The consideration to be received by Copano unitholders is valued at $40.91 per Copano common unit based on KMP’s closing price as of Jan. 29, 2013, representing a 23.5 percent premium to Copano’s close on Jan. 29, 2013. 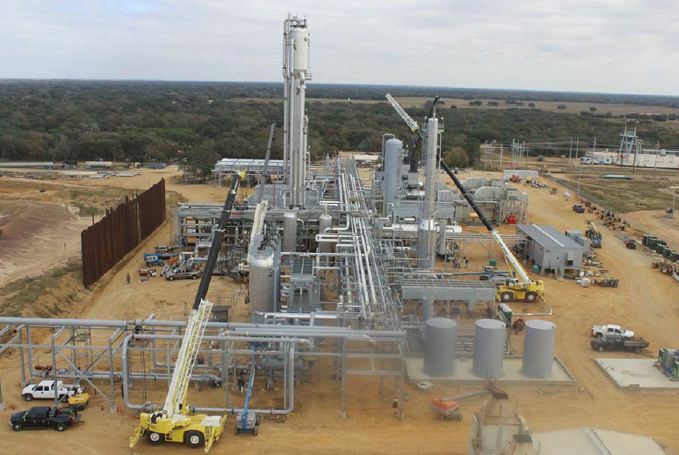 The transaction, which is expected to close in the third quarter of 2013, is subject to customary closing conditions, including regulatory approval and a vote of the Copano unitholders. TPG, Copano’s largest unitholder (owning over 14 percent of its outstanding equity), has agreed to support the transaction. Copano, a midstream natural gas company with operations primarily in Texas, Oklahoma and Wyoming, provides comprehensive services to natural gas producers, including natural gas gathering, processing, treating and natural gas liquids fractionation. Copano owns an interest in or operates about 6,900 miles of pipelines with 2.7 billion cubic feet per day (Bcf/d) of natural gas throughput capacity and 9 processing plants with more than 1 Bcf/d of processing capacity and 315 million cubic feet per day of treating capacity. The acquisition of Copano is expected to be accretive to cash available for distribution to KMP unitholders upon closing. The general partner of KMP, Kinder Morgan, Inc. (NYSE: KMI), has agreed to forego a portion of its incremental incentive distributions in 2013 in an amount dependent on the time of closing. Additionally, KMI intends to forgo $120 million in 2014, $120 million in 2015, $110 million in 2016 and annual amounts thereafter decreasing by $5 million per year from this level. The transaction is expected to be modestly accretive to KMP in 2013, given the partial year, and about $0.10 per unit accretive for at least the next five years beginning in 2014. “Copano’s cash flow is largely and increasingly fee based, and our accretion projections are based on commodity prices consistent with the current forward curve for the portion that is sensitive to commodity prices,” Kinder explained. The acquisition will be immediately accretive to KMI’s cash available to pay dividends, even after KMI foregoes a portion of the incremental incentive distributions this transaction is expected to produce. The increase in KMI’s cash available to pay dividends (net of the amounts voluntarily foregone) is expected to be approximately $25 million in 2014 growing to approximately $70 million in 2016. Upon closing, KMP will own 100 percent of Eagle Ford Gathering (currently a joint venture with Copano), which provides gathering, transportation and processing services to natural gas producers in the Eagle Ford Shale. Eagle Ford Gathering comprises approximately 400 miles of pipelines (including its capacity rights in certain KMP pipelines) with capacity to gather and process over 700,000 MMBtu/day. Citi acted as financial advisor for KMP and Weil Gotshal & Manges LLP and Bracewell & Giuliani acted as legal counsel to KMP. Barclays Capital Inc. and Jefferies & Company, Inc. provided financial advisory services to Copano and Wachtell, Lipton, Rosen & Katz acted as legal counsel to Copano. The cutting edge Seven Viking vessel, designed for operations in the harshest environments is being unveiled and named at a ceremony in Stavanger, Norway, by Subsea 7, Eidesvik Offshore and Ulstein today, 30 January 2013. The next generation Inspection, Maintenance and Repair (IMR) vessel, the Seven Viking, is co-owned by Subsea 7 and Eidesvik and has been constructed in partnership with Ulstein. The ICE-C class vessel with a crew capacity of 90 and a top speed of 17 knots, will work for Statoil on a five year contract. It has been custom-built according to the operator’s specifications to carry out tasks including inspection, maintenance and repair of subsea installations in addition to scale treatment and RFO work scopes (Ready For Operations). The vessel Godmother is to be Christine Sagen Helgø, the Mayor of Stavanger. The Seven Viking incorporates the X-BOW® hull line design to reduce motion in transit and gives increased stability in the potentially high waves that characterise the North Sea. Despite this enviable stability usually associated with size, this version of the Ulstein SX148 design has been crafted to be compact in stature – measuring only 106.5 metres long and 24.5 metres wide. The dimensions will allow the Seven Viking to manoeuvre with ease in confined spaces, such as between platforms, accessing difficult to reach areas. Thanks to a clever configuration whereby hull space is maximised and equipment is integrated within a large hangar area, the Seven Viking and its crew have the ability to carry all necessary maintenance equipment on board, ensuring that operational downtime is kept to a minimum. Safety, efficiency and environmental considerations have been the prime focus for the three partners when developing the Seven Viking, which carries the Clean Design notation. A customised module handling system (MHS) has been integrated in the ship’s hangar for the safe launch and retrieval of subsea modules weighing up to 70 tons through the moon pool. To facilitate cooperation and communication, all operational personnel are gathered in one area adjacent to the hangar, with panoramic windows in the control room giving a full overview of this key activity area. The Seven Viking has been developed to meet the highest working environment standards, and is classified as a comfort class COMF-V (3) vessel. Minimal noise levels in the hangar have been achieved by opting for electric winches for the ROVs, the MHS and other utility equipment. Notable environmental initiatives include diesel electric propulsion, which reduces atmospheric emissions, and the electrical winches which nullify the risk of emissions of hydraulic oil.